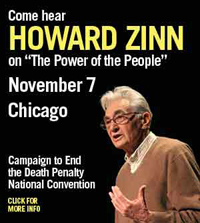 Howard Zinn is a historian, author, social activist, and American icon. His book A People's History of the United States has sold over two million copies. Welcome back to OpEdNews, Howard. The dust has had a chance to settle a bit since last month's airing of your documentary "The People Speak." What kind of feedback have you gotten so far? 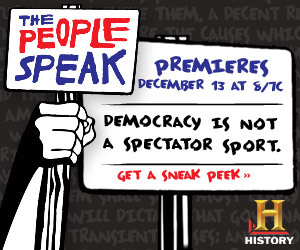 We've received lots of nice messages on "The People Speak." The History Channel tells us that eight million people have seen part or all of the film, and two million on the first night it was shown (apparently they have no way of telling if a viewer cuts out on the program). It will be on the History Channel again February 22nd and March 1st. That's impressive and must be gratifying for all of you involved in the project. There's still another half hour of new material in the DVD that is being released next month, correct? What haven't we seen yet? Yes, Joan, the History Channel program is 90 minutes, the DVD two hours. A bunch of readings we had no room for in the TV version: Marisa Tomei reading a Lowell mill girl of the 1830s, Benjamin Bratt reading an ex-slave responding to his master who wants him back, Danny Glover reading a black state legislator in Georgia responding to his expulsion from the legislature, Kerry Washington reading Fannie Lou Hamer, Marisa reading Cindy Sheehan, Sean Penn reading Kevin Tillman (brother of football star Pat Tillman killed in Afghanistan). And more, including the singer Pink with her song, "Dear Mr. President." I read that there was a huge amount, something like 97 hours, of raw footage. So much wonderful material ended up on the cutting room floor. How ever did you decide what went in? A big question. We wanted the most dramatic readings, and the ones most relevant to what is happening today. I'm sure that generated some lively discussions. In the film, you touched on the difference between the Declaration of Independence and the Constitution, penned only a few years later. I'd like to know more. Why was there a shift in the attitude of the framers of the Constitution? No change of attitude. One was a manifesto, rhetoric to rally people. The other a legal document, expressing their real desires. This small but important difference seemed to signify something larger. The Declaration's original phrasing "life, liberty and the pursuit of happiness" was tweaked, becoming "life, liberty and property" in the Constitution, neatly encapsulating the tension between democratic and aristocratic principles. That tension continues to this day. We may not have landed gentry and inherited titles on these shores but we do have Big Business, which consistently rides roughshod over the interests of the rest of society. On that note, would you like to comment on the Supreme Court's decision last week to strike down corporate campaign finance limits? Liberals get excited about things like that as if they signal a dramatic change. No, the corporations ran our elections before the decision and will do so now -- just with a fig leaf of "legality." The designation of corporations as "persons" which started in 1886 is just proof of how our legal system, the Constitution, the courts have always been tools of the wealthy classes. The more things change, the more they stay the same. You lived through WWII. Although you were fighting overseas, your family and everyone else were part of the American war effort. They had ration cards, did metal drives, planted Victory Gardens. There was a real feeling that we were all in this together. What we have now is something else entirely. It started when Pres. Bush told everyone to help the fight against terrorism by going shopping. Something vital has been lost. Can you comment on that? On the international front, Haiti recently suffered a devastating earthquake. At this point, we still don't know how many people died as rescue and medical efforts continue. Americans have a notoriously short attention span and aren't generally interested in other nations' history. If we were to look beyond the corruption of Duvalier father and son, we would see that America had a hand in making Haiti what it is today, wouldn't we? Haiti is one of the most shameful episodes in U.S. foreign policy because Haiti is a neighbor (as is Cuba, where a similar relationship has persisted) and we have treated Haiti with cruelty all through our history. When it became the first independent black Republic in this hemisphere, defeating the Napoleonic army, the administration of Thomas Jefferson (ironically, author of our Declaration of Independence) refused to recognize it.